Good looking. Numbers large enough to easily read. Useful functions and easy to figure out how to set it. 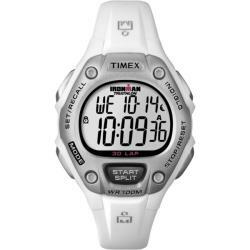 A silver resin case houses a digital chronograph, countdown timer, lap counter and Indiglo night light in this women's Timex Ironman watch. 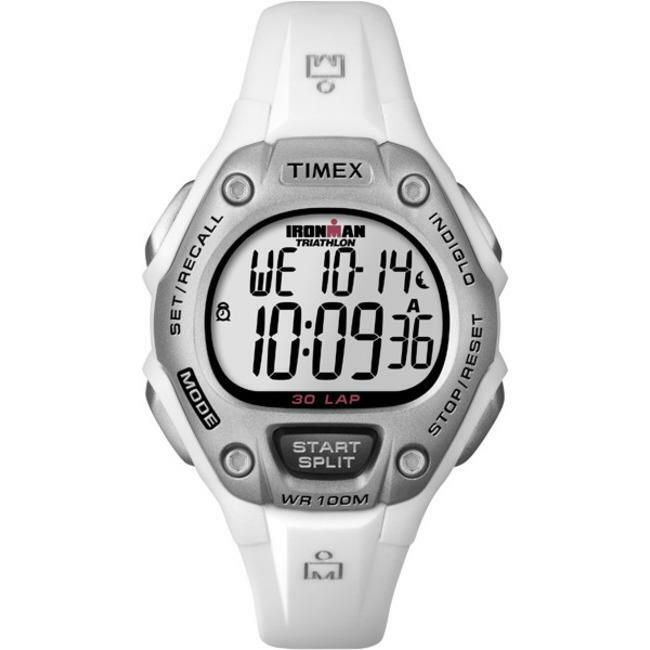 A white resin strap finishes this iconic watch that's great for athletes of any level. Dimensions 8.5" x 3.9" x 4.3"
Great watch, love the Timex Ironman series as this is my second one. My first one is still going strong but was getting a little on the shabby side so I went for the clean, crisp white look. I love that it is more stylish but after couple weeks it is already getting tints of color and stains from outside wear/tear. I hope that I can keep it relatively clean for a while! Great watch, but the white band gets very dirty quickly and picks up colors from dark clothes and other external objects. I got this watch for exercise - it is water resistant and keeps time as well as laps. It is perfect! I loved this watch at first. But after wearing it for a few weeks the bands were turning a dingy color. The color from my jeans and other clothing seem to rub off onto the band. I tried to clean it but was unsuccessful. My last resort will be Mr. Clean sponge. I just don't like hoe dirty it looks! The face is still nice and white. should have noticed i ordered white, whoops! I got this for myself, and boy am I glad I did,it keeps great time well worth the MONY .. I have had several Ironman watches. Call it my Mommy watch. A timer plus 3 alarms keeps me organized. Plus love the lighted display at night and it's waterproof! If only the straps lasted as long as the watch. I go through one every couple of years. I like the look of the watch it is simple and sleek. "Does it have an interval timer?" "Does the this watch have 24:00 time display?" "Will this watch count laps for a pool that is only 40 feet?" Yes, you can adjust this watch to the distance of your laps. "does this watch have more than 1 alarm?" No, this watch does not have more than one alarm.